Have you ever stopped to think why some marketers get to build a massive email list even without a website? …or while others can’t acquire at least ten people to sign-up despite having set-up everything? Next, they incorporate these three tactics into a proven process which we’ll dive into today. I’ll share the process in a while in 5 steps. But first, you need to understand why list building should be your top priority. Prioritize Email List Building. Why? 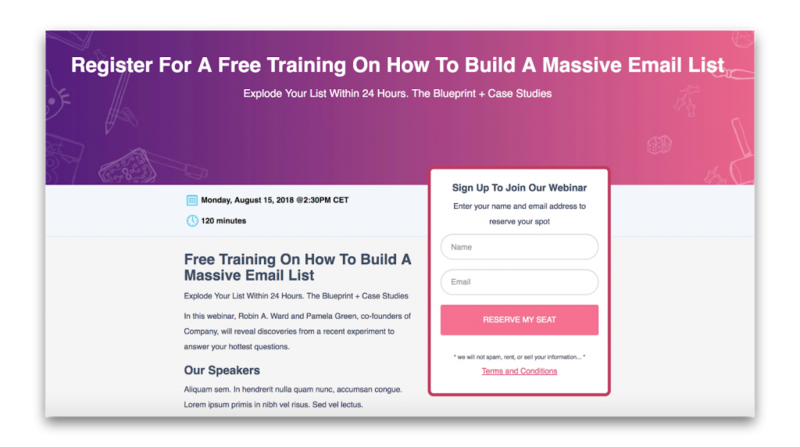 Why build an email list? Spend less on marketing: Unlike advertising, email marketing is cheaper. Once you have an email list, nurture that list for conversions. Build long-term relationships: People keep the same email address. It would be impractical for someone to change their email addresses when they used the same for their social media accounts, etc. Now check out my five step-process below on how to build an email list without a website. Step #1: Give away something for free that’s extraordinary and well-researched. For you to get the ball rolling, first, you need to have a lead magnet. You already know what a lead magnet is. But what you should be more concerned about is how to make it the best free offer possible. Everybody’s putting out free stuff especially your competitors! The last thing you want is to be dull and boring. 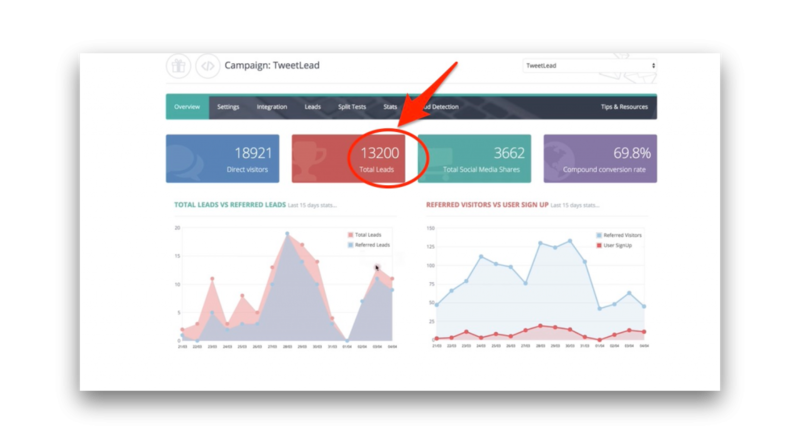 Back in the day, I managed to get 13,200+ email subscribers by promoting a free tool called TweetLead. Note that TweetLead is a two-page website – however, the main idea here is that you give away an incentive. Research your target audience. Your opt-in offer must relate to their interests and pain points. Deliver so much value. To make the most valuable offer, focus on real solutions that your audience can apply right away. Target different learning styles. While using one format is already excellent, a combination allows you to focus on all types of learners. 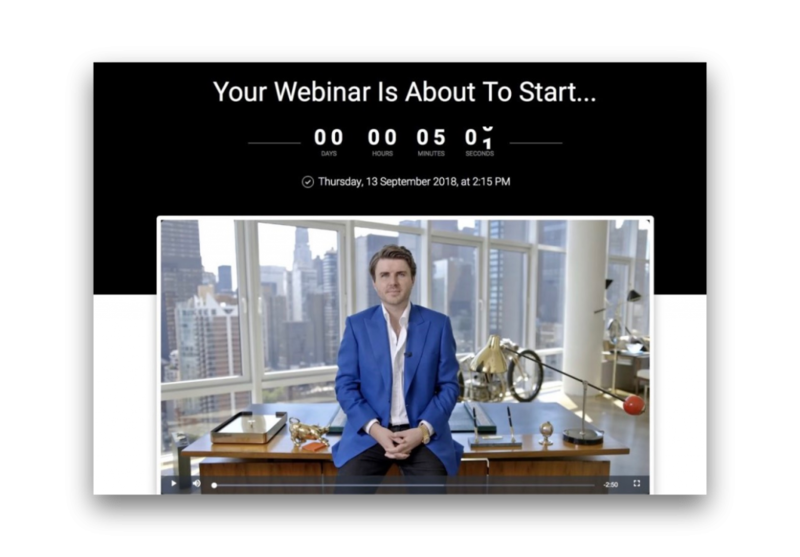 For example, Sam Ovens who runs an 8-figure business offers a free webinar that combines video, audio, and text. Here’s a post about 41 lead magnet ideas to get you revved up. 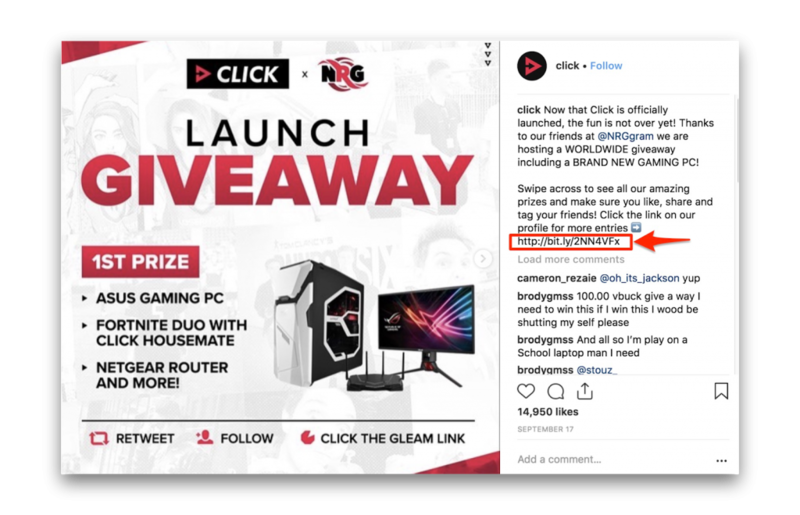 PRO TIP: Partner up with a brand in your niche and let them sponsor the prize in exchange for free exposure. Step #2: Build a landing page with your lead magnet and sign-up form (that requires prospects to enter their email addresses first). 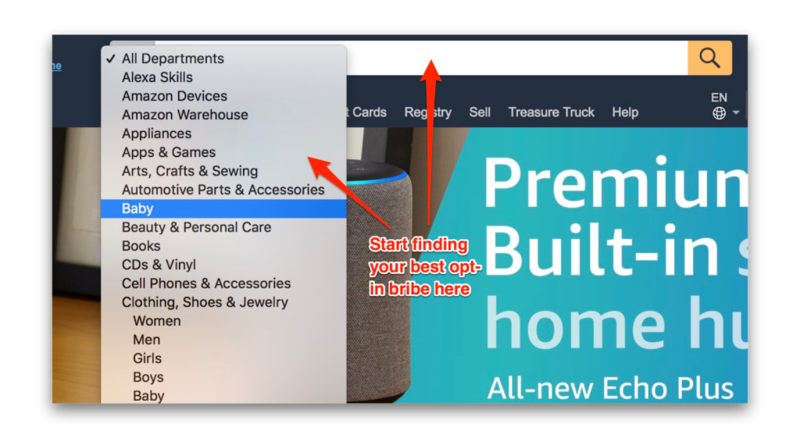 Once you’ve decided which lead magnet or opt-in bribe to use, choose a platform that lets you build a landing page and hosts your giveaway campaign. To most people, this feels like the most tedious part of the process. Head over to UpViral – my viral marketing tool. Be sure to create an account first. Next, start a new campaign and enter your campaign name. Complete all the details of your UpViral campaign, from your freebie or opt-in bribe to your landing page copy. If you’re going to make your campaign a contest to build up more hype, specify points for email sign-ups. UpViral also lets you assign points for custom actions. 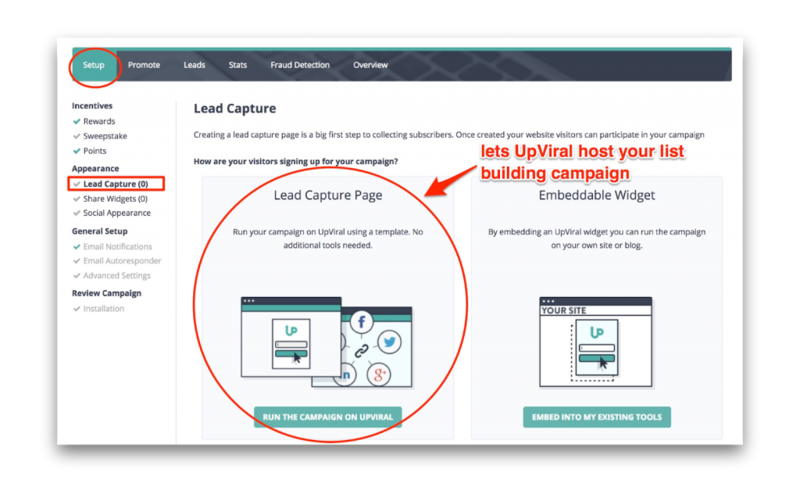 Since you don’t have a website, choose “Lead Capture Page.” That way, UpViral hosts your campaign. Main headline. Go direct to the point. Tell visitors what they’ll get. Supporting headline. Explain your main headline. Persuasive copy. Write all the details of your lead magnet. State the key benefits and anticipate their questions about the free offer. Image or video (or both). Visuals catch the eye. Use them strategically to show what your lead magnet is and its purpose. Social proof. Collect testimonials from previous users of your lead magnet. Start with your friends and family if you do don’t have a huge following to gather testimonials from. Lead capture form. Ask only your visitor’s name and email. Fewer form fields allow for a faster signup process. 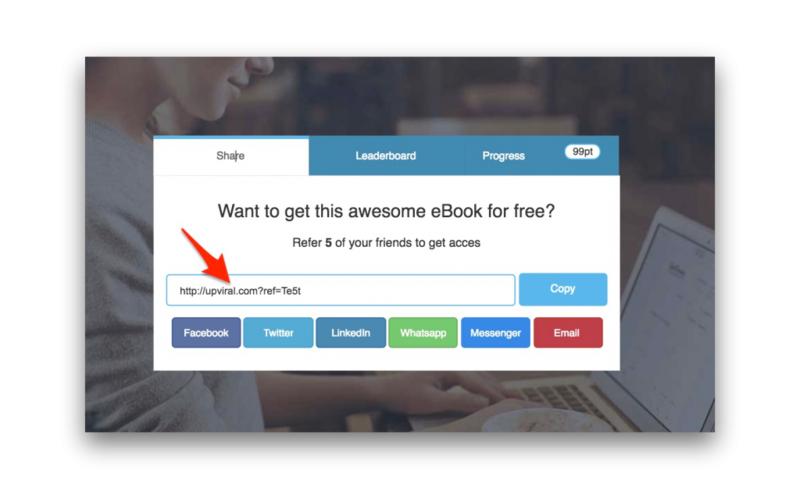 Step #3: Create a “share” page that turbo-charges your email list growth. Dropbox used a badass formula. First, asked people to register their email address to use the service. Second, gave them the option to acquire up to 16 GB. 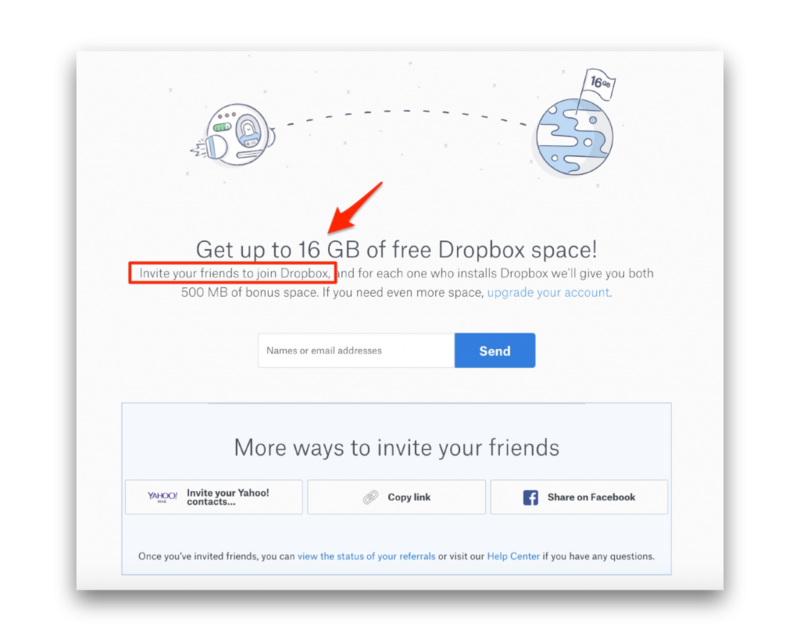 Third, to get up to 16 GB, users needed to invite their friends to sign-up to Dropbox through a share link. Offers them a free upgrade if they get X of their friends to sign-up through a unique invite link. UpViral lets you create a share page (screenshot below). Notice the share buttons below the referral URL. You have the option to include these other share options so visitors can instantly spread your campaign. If you are running a contest campaign, assign points to visitor actions and give your reward only after they reach the maximum points. Step #4: Get eyeballs to your landing page. If you don’t promote it, nobody sees it. Getting the word out about your campaign is perhaps the most challenging yet exciting part of the list building journey. Catch your audience’s attention no matter where they are using the tips below. Strategy #1: Start with your connections. For example, you can create an Instagram post that features all the details of your campaign, like the one below. Write a call-to-action that invites your audience to check out your bio for the link to the landing page. Also, mention the URL as an alternative so they can copy and paste it. PRO TIP: When promoting on Facebook, I would suggest you create more than one post about the giveaway. Use different elements for your FB posts… a different image, story, and call-to-action. Over the course of a week, identify which post got the most engagement. Boost that post to reach more prospects. If you have an existing small email list, leverage that. Message your subscribers, invite them to get your free stuff or participate in your contest. You may use my simple template for a contest announcement. Feel free to tweak it accordingly. I’ll be giving away free stuff to 5 lucky winners. How to join? Simple – share my contest with your friends and get them to participate. Get the word out. Good luck! Reaching out to your current followers is an impressive way to start. The fact that you’ll be giving out free stuff entices them to help you reach new prospects. Strategy #2: Post it on contesting websites. If you want to take the fast lane, consider using contesting websites. These sites feature giveaway campaigns from around the web. The best thing about this site is that you can categorize your giveaway. To use Freaky Freddie’s, contact them. Check out our massive list of 100 contest promotion websites. Strategy #3: Maximize your Quora presence. Quora is not just a Q&A site. It’s a treasure trove of opportunities to promote yourself as an expert and influence people to act on your offer. Just so you know, 100 million people check out Quora every month. How to build an email list without a website using Quora? Simple: Look for questions in your niche and answer them as best as you can. He linked to his website from the anchor text The Altucher Confidential. Since you don’t have a website, lead prospects to your landing page instead. If you use UpViral for your campaign, UpViral gives you a campaign URL which you can copy and paste into Quora. [Step 1] Follow relevant topics by entering them into the search box. 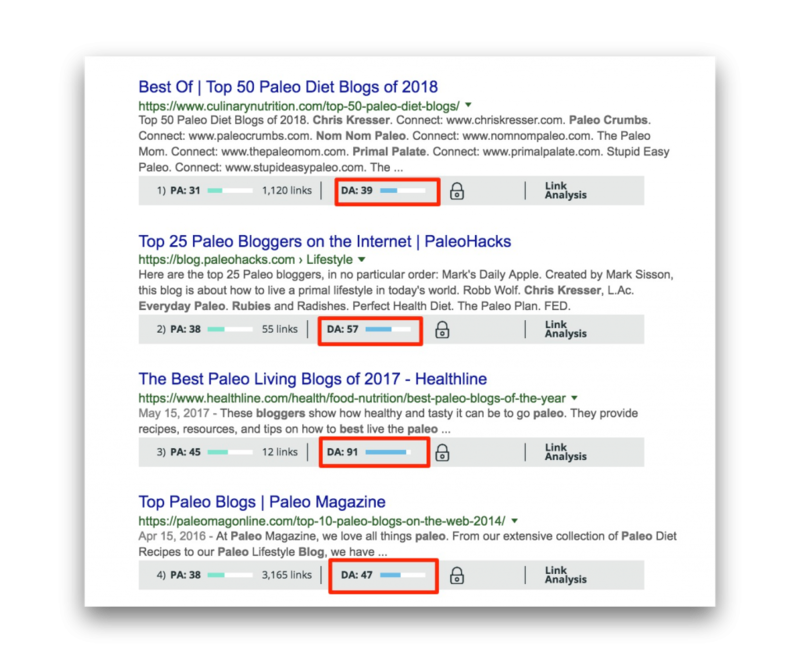 Strategy #4: Guest post on high-traffic blogs. Setting up a blogger outreach campaign is time-consuming. But as part of the process of how to build an email list without a website, it’s an amazingly powerful long-term strategy. Now type this into Google: best blogs [your niche] to get a list of prospects. You may need to visit each blog and note its relevancy, authority, and engagement. I’d like to start with a basic excel spreadsheet for prospecting. Blogger’s name should be the complete name of the blogger. Decide later on how you’ll address him/her in your outreach email. Website URL is the site’s web address. Latest Posts Engagement should include the number of comments and social shares the blog gets. You want your guest post to receive the same engagement level. Contact can include email addresses or links to contact forms or active social media pages. Identify the best ways to reach the blogger. Notes entail any vital information you need to remember about the blogger. PRO TIP: Create a guest post around the topic of your lead magnet. Make it so informative and engaging that the blog’s audience will read your entire post. Introduce your freebie or giveaway as a content upgrade and link to it from your conclusion or author bio. Strategy #5: Run Facebook ads and target people who interacted with you. Remember strategy #1 which is starting with your existing tribe (social media followers + current email list)? You can combine both platforms to get as many people as possible to join your campaign. What do I mean? Let me cite an example. During UpViral’s two-year anniversary, I promoted a special offer + a bonus package which I set to run for three days. I ended up making $51,495 in a few days. See my stats below. As you can see, my Facebook ads strategy entailed targeting an “already-engaged” audience. People who already know you are likely to refer you to their friends. Since their friends trust them, they’re likely to promote your campaign to more of their friends. Step #5: Identify what worked and what didn’t. Rinse, repeat. 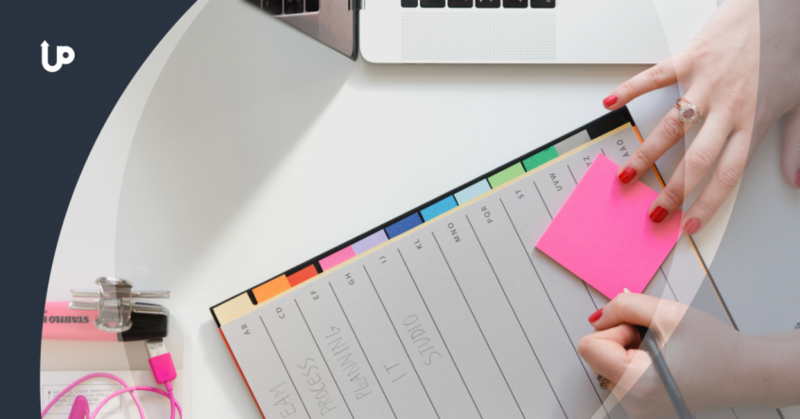 Replicate the things that worked and immediately improve the ones that didn’t work if you want to extend your campaign duration… or create a new one in the future. Pick a prize or lead magnet that genuinely relates to their interests and takes advantage of their learning style (if your offer is an educational piece of content). Use a tool that hosts and sets up your entire campaign from start to finish. In that case, UpViral. Promote your campaign to your existing audience (social media followers and current email subscribers). 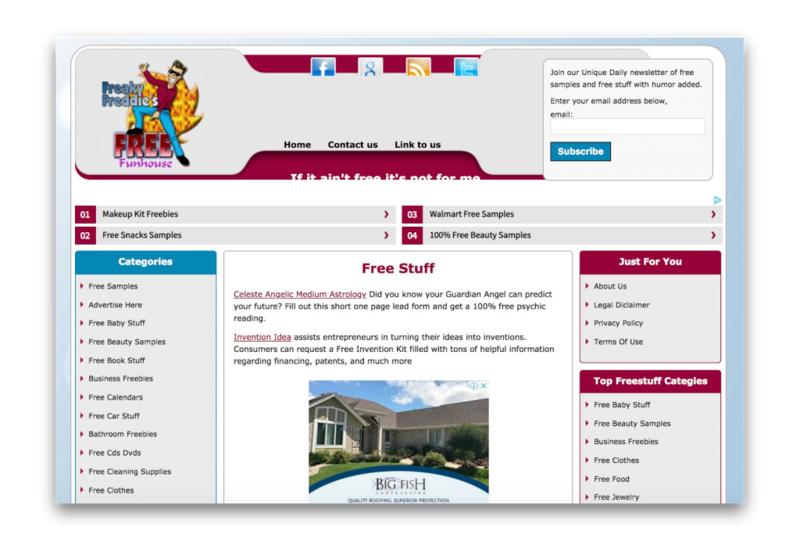 Post your giveaway campaign to contesting websites like Freaky Freddie’s. Create an optimized profile on Quora and find relevant questions to answer. Start a guest blogging campaign and link to your landing page from your conclusion or author bio. Target and retarget your engaged audience with Facebook ads. Review your entire strategy and make tweaks where necessary for a higher success rate in the future. Got better ideas to increase your email subscribers before your website launches? Share your thoughts below.